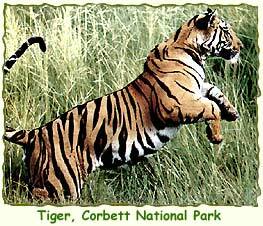 Jim Corbett National Park is located in Terai, the foothills of the Himalayas in the Nainital district of Uttaranchal. This is the first wildlife reserve of India, extending over an area of more than 500 sq km. Jim Corbett National Park is famous for its wild population of Tigers, Leopards and Elephants and many other species. The Corbett National Park was named in the honour of the late Jim Corbett, the legendary hunter-naturalist turned author and photographer, who spent most of his years in this area and contributed in shaping the park. The Jim Corbett National Park is home to about 110 tree species, 50 mammals species, 600 bird species and 25 reptile species. A well-protected wild habitat, Corbett provides an unforgettable experience to a nature lover. By Air : Phoolbagh, Pantnagar at a distance of 50-kms is the nearest airport. Delhi at a distance of 300-kms is the nearest international airport.